TBILISI, DFWatch–Georgia’s speaker of parliament calls on authorities and the opposition to avoid making statements that justify violence, as the tension continues surrounding a lawsuit about the ownership of opposition TV channel Rustavi 2. Following statements by the prime minister and the president, Speaker Davit Usupashvili explained his position in a Facebook post on Thursday. He wrote that every politician who is in office or in opposition has to reject calls for, or justifying, violence or physical confrontation, directly or indirectly, and also any kind of disobedience towards decisions made by the courts, police or other authoritative state bodies. In the future, he wrote, these are the only preconditions for cooperation and dialogue. Earlier the same day, PM Irakli Garibashvili accused the National Movement of releasing sexual abuse videos and said that the party should be grateful that people haven’t done the same to them as what was seen in the footage. 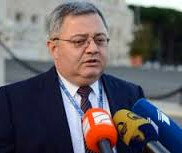 In response, President Giorgi Margvelashvili said the PM’s statement brought more tension and endangered the constitutional order. Most of the cabinet members backed Garibashvili’s statement and criticized the president for making ‘irresponsible’ statement. Authorities assure they are not interrupting a lawsuit about the ownership of Rustavi 2 and maintained that the process is open and transparent. Meanwhile, the opposition accuse authorities of using the videos in order to divert attention from the events surrounding Rustavi 2 and the negotiations with Gazprom.